Well, I guess they’re all beasts, but some are awfully beautiful. This is part 3 of the critters at Zoo Atlanta. I couldn't find what species of dragonfly this is. 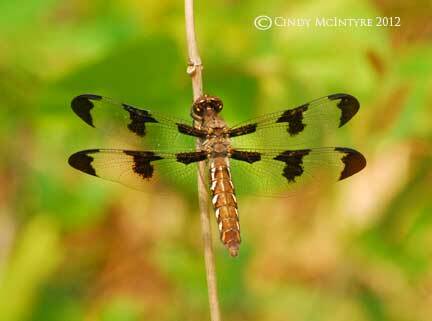 So I ordered a dragonfly identification book for future reference. Pandas are guaranteed to draw ooohs and aaahs from zoo visitors. 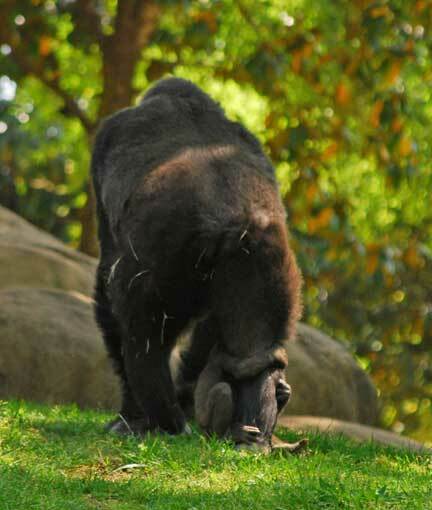 And the nice thing about writing a blog after visiting the zoo is that I get to learn more about them. Giant pandas like Po, born 17 months ago to 14-year-old Lun Lun at Zoo Atlanta, are found in only four zoos in the U.S. Memphis, Washington D.C., and San Diego also. All are on loan from China for 10 to 12 years, and China owns their cubs, too. Wild giant pandas are endangered in their cold and damp mountainous habitat among fir and bamboo forests in a small area of southwestern China. That country has an intensive program to study and save them from extinction, and they are considered National Treasures. There are only 1600 or so wild Giant Pandas left, and 300 in captivity. Each of of the four zoos here has a specific research focus on panda well-being, and the fees zoos pay to lease the critters helps their preservation efforts in the wild. When President Richard Nixon visited China in 1972, Mrs. Nixon remarked that she loved seeing the pandas, so China sent the first ever in America to the Washington, D. C. zoo as a gift that year. 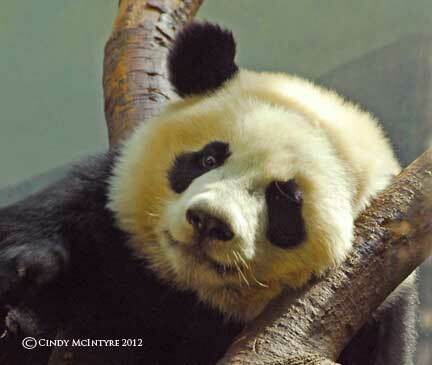 Although classified as carnivores, pandas eat mostly bamboo shoots, leaves and roots. 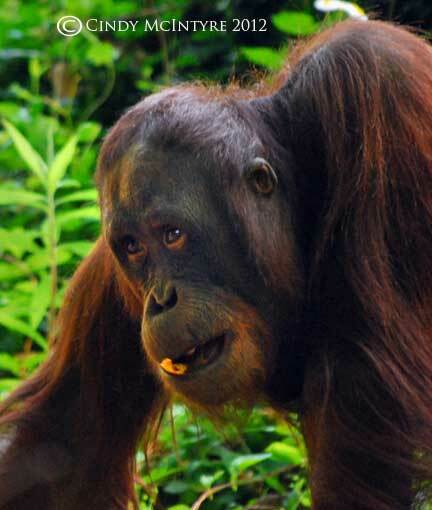 In captivity they can be finicky eaters, and are fed several varieties of bamboo. 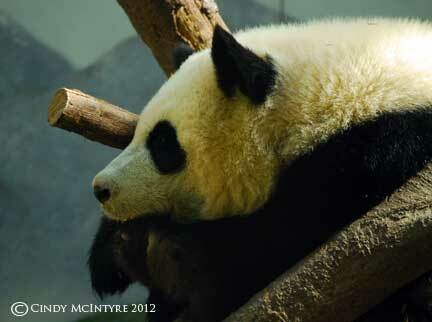 Zoo Atlanta has a Panda Cam so you can watch them playing outside 10 am to 5 pm weekdays. Read the National Geographic article about how zoos get pandas. 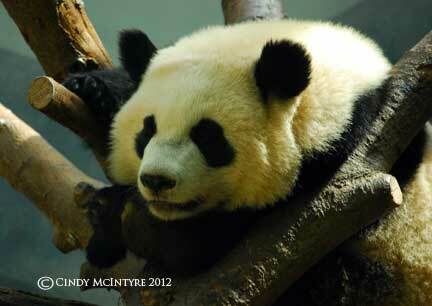 And check out Zoo Atlanta’s panda page. And Pandas International’s site as well. 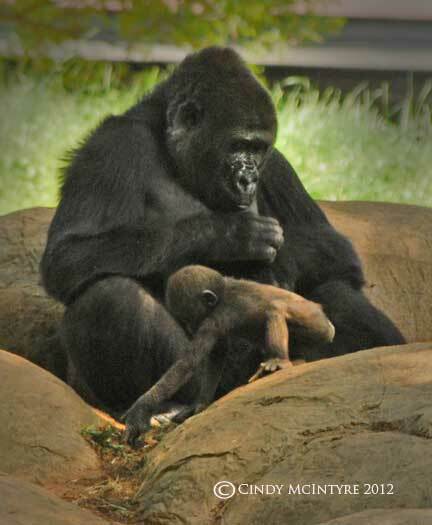 Zoos are not just for entertaining Homo sapiens; they are playing a critical role in preserving species threatened in the wild. I was dismayed during my visit to Zoo Atlanta to learn just how critical the populations are of many iconic animals in their native habitats. I was also sorry that most of the visitors didn’t bother to read the signs that talked about the dangers faced by gorillas, leopards, orangutans, rhinoceros, and others known and unknown. 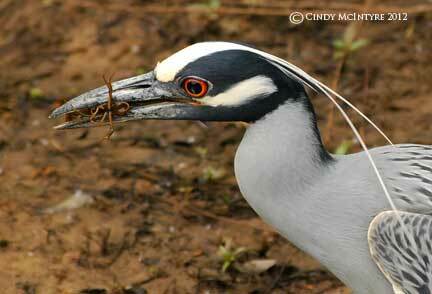 Poaching is a huge business, and habitat destruction is wiping out many sub-species forever. Zoo breeding programs may not result in many animals being released into the wild, since there isn’t much “wild” left anymore. But they do preserve what’s left, and perhaps some day things may change and humans will realize that nature reserves and parks aren’t the only place animals should be allowed to thrive. 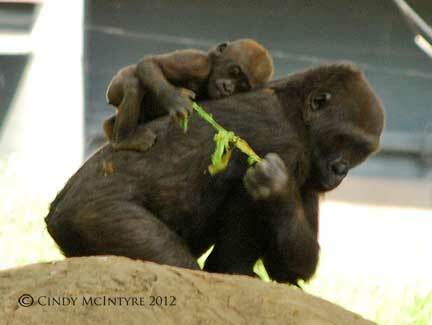 Gorillas have long held a fascination for us, partly because they are so similar to us in many ways. It’s easy to see how they can be our relatives, especially when a serene mother carries and caresses her little baby, and when the youngsters play with each other. Their fierce visage and huge build belie a gentleness that they show with each other. 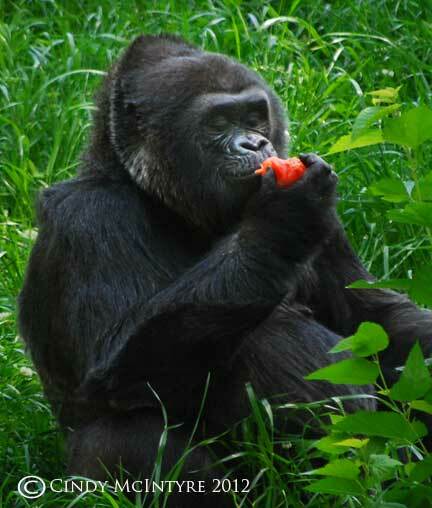 One brawny gorilla sat eating a tomato, savoring the little bites, manipulating it delicately with its sensitive fingers. A tiny baby clung to its mother’s chest, and then slipped down her leg, staying tightly wrapped as she moved to a better spot. Later it hopped off to play with a juvenile, and an older sibling got a “piggyback ride.” I’m glad I brought my binoculars, as sometimes they were too far away to see details of their goings-on. 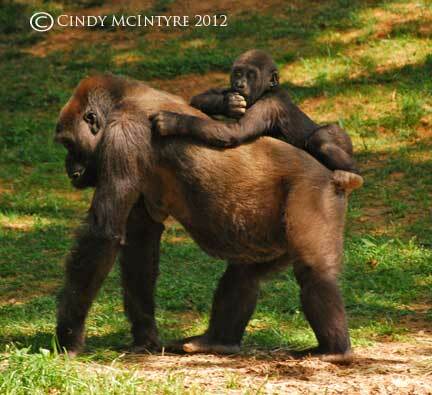 I’ll post more on the critters at Zoo Atlanta next time.